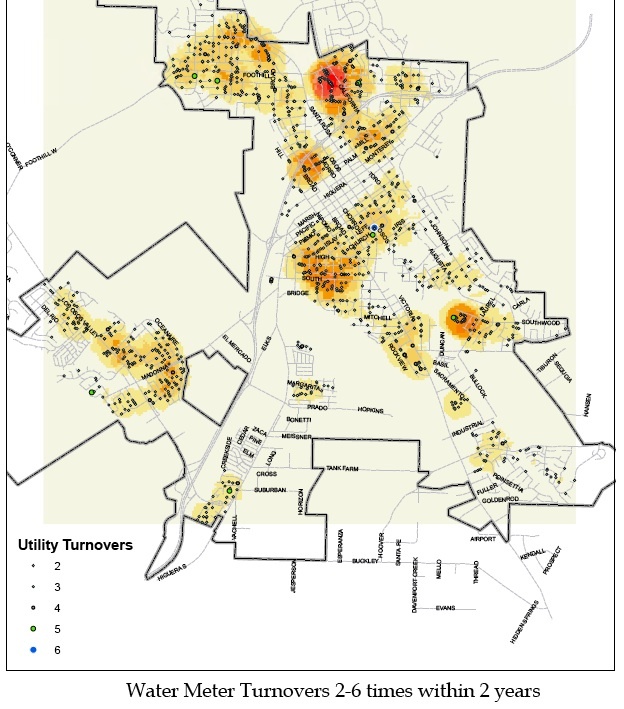 This is a map showing where water meters have turned over frequently. A water meter “turning over” means that someone has cancelled service on their meter… and another person has started service. This typically happens when one person moves out of a unit… and another moves in. Tracking water meter turnover is a way of tracking unit turnover… how often people move in and out of a given unit. So in the above map… the more red the color… the more frequently the turnover of units to new tenants or owners. In some cases as much as 5 or 6 times in a two year period. According to city-data.com the northern 93405 zip code section of San Luis Obispo is 36% owner occupied while the southern 93401 portion is 43% owner occupied housing. Contrast this to a +/-60% owner occupied average state wide. It would be interesting to know the evolution of this over time. I know that in my own neighborhood Downtown… there are less and less rentals and more owner occupants ever year. But this has only been happening for the last 10 years or so. Prior to this my area was almost entirely rentals. The areas seeing the largest increase in rentals appear to be those surrounding Cal Poly. It is akin to squeezing a balloon… when the rentals leave one area… they pop up in another. Cal Poly has suggested that they are interested in seeing all first and second year students live on campus. This would be warmly received by the long term residents of SLO. It is a two edged sword living in a college town. I love the vibrancy, life, and financial stability that the college provides. I also love having so many talented professors and the knowledge and experience they bring our city. But the landlords that do not maintain their properties and the tenants that do not respect their neighbors act as a sort of cancer around town. The neighborhoods most affected by lack of maintenance on the part of some owners and lack of control on the part of some tenants… are those on this heat map that appear the most red. Most tenants are awesome I should comment…. it is usually only a percentage that cause issues. 90% these issues can be resolved through better lease language, better property management, and higher property maintenance standards on the part of landlords. If you own a rental in town… this a basically a business you are profiting from. I personally believe that businesses should be treated differently than residences. Owner occupants usually care for their properties far better than landlords…. but when the landlords outnumber the owner occupants… and their lack of maintenance impacts the balance of the community so greatly… it becomes a serious issue for the long term viability of that city.